If you’re looking for a credit card that will help teach your family to spend responsibly, our Visa Platinum Family Credit Card is the right card for everyone! Security- Sign your card up for our free smsGuardian Text Alerts to track all your transactions, and also help deter fraudulent charges that could occur. Read more about the additional features and benefits of this card. Learn the importance of financial management with our Visa Platinum Family card; Apply Today! 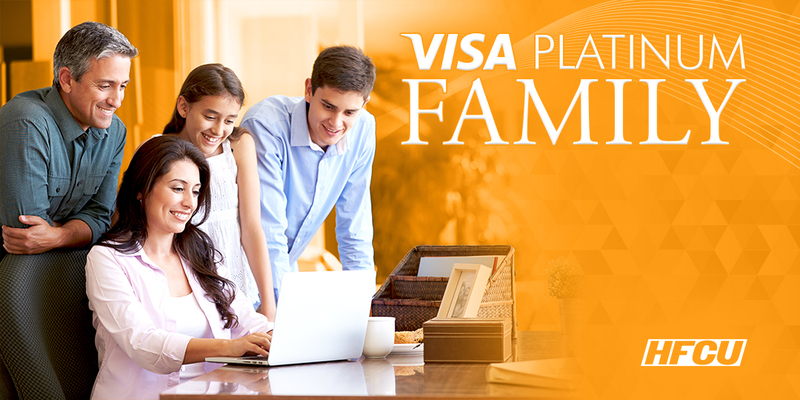 Apply for Your Visa Platinum Family Credit Card Today! APR is Annual Percentage Rate. Certain limitations, exceptions, and restrictions apply. The introductory rate is valid for six months. After the six months introductory period, the rate you receive will be variable, based on your credit history at the time of application; not to exceed 18% APR. The Variable Rate is based on an index, which is the Prime Rate as published in the Money Rates section of The Wall Street Journal on the last business day of the month and is subject to change monthly. Any change in the Index will be effective the first day of the first billing cycle immediately following the date of the change The Wall Street Journal Prime Rate as of December 20, 2018: 5.50% APR. The introductory rate is only available for new HFCU cardholders. Rates are subject to change without notice. Additional details are available on www.houstonfcu.org or by speaking to a member service representative when you become a cardholder.Message and data rates may apply. The cell phone or mobile device must have the ability to send and receive text messages, and the use of “shortcodes” must not be blocked. Shortcodes are special telephone numbers, often five digits long, which are used to send text messages from mobile phones. You are responsible for any text messaging fees from your carrier; message and data rates may apply. This service is available for the following carriers listed at https://www.cardguardian.com/CardGuardian/carriers.do.